Living life one cup at a time. This is an older post, but I have decided to post it again because it is a very current subject. This post includes what is going on in Uganda, what the LRA is, and how you can help through the organization called Invisible Children. Most of this was written by a guest blogger, Chris Rosenberry. Please read, learn, and then help. It is so easy and can be done right through this blog. Thanks! Two weekends ago, I started a segment called “Why Weekends” in which I want to look at problems in the world that we, as inhabitants of our planet, are all responsible to be a part of changing. I do believe the Christians should be motivated by the love of God to make a difference in light of these issues, but I also think it is something for everyone to work on no matter what you believe. The first one was about extreme poverty in the world and one way to be a part of the solution (give it a read if you haven’t Why Weekends–Why and WorldVision-Part 1). I intended to get to Part 2 this week becauase I was sick over the weekend, but another solution to an extreme poverty related issue presented itself to me and I wanted to move on it. “How You Can Be the Change” will be an occasional segment for opportunities that come up to offer you ways to “be the change” that the world needs with minimal effort on your part. Part of this will be to include “experts” when I can to give you first hand information and experiences from other people. Today I was able to do that. I have asked my friend, Chris Rosenberry, to write and tell you about an organization called “Invisible Children.” If that sounds familiar it might be because it is on your computer screen right now. Look to the left of the page. There is a widget called “Social Vibe”. This is a way for you to raise money and support for charities by just watching ads online. That is all you have to do. You only have to sacrafice a couple of minutes. So easy! 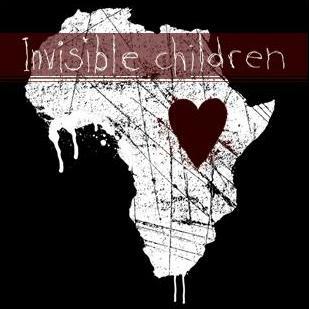 I have chosen Invisible Children for my charity because what they do is awesome and what they are fighting is awful. Instead of me telling you about it, I will let Chris give tell you about his experiences with the organization and about why it is so important to him. Chris went to North Greenville College with me for a little while (Go Mounties!). He is now the Youth and Arts pastor at The Refuge in Hilton Head, SC. He is the husband of but one wife and the father of three. Chris has a passion for social justice, obscure music, and the Philadelphia Phillies. Five years ago my eyes were opened to an unseen tragedy that would change my life, and the lives of my family, forever. I had just begun working as a youth pastor in Hilton Head, SC and was looking for ways to get my students involved in missions projects which we could support without getting in a van or on a plane. In my research, I found a video, backed by the Killers’ song “All These Things That I’ve Done” (an instant selling point), where high school and college aged students were giving up the comforts of their beds to sleep in fields and parking lots, writing letters, and trying to make people aware of one of the greatest disasters of their generation. For well over 20 years a war has been waging in East Africa, in the nation of Uganda. This war, a civil war, began as a well supported uprising within the Acholi people, the people of Northern Uganda, against the nation’s government. But when its leader was exiled and a new leader, named Joseph Kony, attempted to take control of the rebellion by creating his Lord’s Resistance Army (LRA) support dwindled. With little support from his own people, Kony and the LRA resorted to abducting children and forcing them to fight as part of the LRA. Since Kony took control of the rebellion, thousands of children have been abducted and thousands have lost their innocence and their lives. It is estimated that currently 90% of the LRA is made up of children, and that over the years as many as 66,000 children have been abducted. It is also estimated that over the course of the war, over 1.8 million Northern Ugandans have been forced into Internally Displaced Camps (IDP camps) as a way of minimizing the casualties of this war. And though about 900,000 of these people have been allowed to return to their homes, there are still almost 1 million people living in IDP camps where approximately 1,000 people die every week. The war in Northern Uganda, which has now also spread to Congo and other East African nations, has been called the greatest humanitarian crisis in the world today. What is worse, is that for many many years this crisis was completely invisible to the outside world. That is, until 3 film students from San Diego got on a plane and discovered what was to become their life’s work. They came home with footage of children walking for miles each night to find a safe place to sleep, footage of the Acholi people living in fear of the LRA, and footage of aid workers asking for help. They also came home with a mission, and shortly thereafter released their footage as a documentary film entitled Invisible Children: Rough Cut. This film was the genesis of an organization that would commit itself to ending the war in Uganda, restoring the Acholi people, and helping to make the universe of East Africa a safe and thriving place for children to grow up. That organization is called Invisible Children. 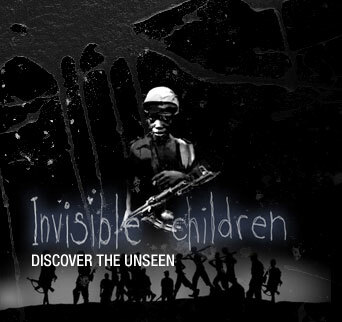 Since that first film, which was released in 2003, Invisible Children has seen much change in Northern Uganda. Schools have been rebuilt, peace has been as close as a signature way, children feel safe to sleep in their own homes, laws have been passed in the United States to aid Uganda in the capture of Joseph Kony, and hope seems very much alive. But the work is not complete. Joseph Kony and the LRA are still at large. They continue to terrorize the people of East Africa, with most of their focus on the nation of Congo, and they continue to abduct, abuse, and enslave children, but Invisible Children will not give up. There are times when we say to ourselves, “Someone else will take care of that problem” or “That is not my problem,” but what I have learned is that there are those who do not have voices of their own, who cannot speak up and ask for help, who do not have the power or influence to affect change, and therefore it is the job of those of us who have a voice to speak up, to act, to not rest until justice has been found.. The cause of Invisible Children has shown me my voice, my students’ voices, my wife’s voice, and even the voices of my small children. We will not rest until there is peace and restoration in East Africa, and we pray that you will join us. For more information, ways to get involved, media resources, or ways to donate to the cause please visit Invisible Children. Don’t forget, you can EASILY help Invisible Children make a difference by just clicking on the widget to your left and watching some ads. Come on. It is simple. Then go to the website and find out other ways to help, like Chris said. Don’t forget to become an email subscriber. Updates will be sent automatically to your inbox! If Chris blogging brought you here, please check out my other posts.